The wind was gusting around the Golden Gate Bridge on a March afternoon in 2005 when a 22-year-old man climbed the railing, convinced he and this world would be better without each other. He put himself on a thin beam 220 feet above the Pacific Ocean. The man had just lost his job and felt overwhelmed as a new father. Kevin Berthia wanted to die, and he had come to the world s most effective suicide destination to make that happen. That's when he met a highway patrolman, a former Army soldier and San Quentin State Prison guard named Kevin Briggs. "I know you must be in tremendous pain," Briggs said over the railing. "If you want to talk, I'm here to listen." The next 90 minutes saved Berthia s life. "I opened up about stuff I d never dealt with before," he recalls. Kevin gave me a reason to try again. Berthia is one of hundreds of Americans to come within inches of ending their lives with a jump off the Golden Gate Bridge, only to meet Briggs and decide to give life another chance. Out of those hundreds who have talked with Briggs on the bridge, only two have jumped. As he told the San Francisco Chronicle, "I've talked to people from ten minutes to seven hours. I very much despise losing. I do whatever I can to get that person back over the rail. I play to win." Before his days at the Golden Gate, Briggs spent three years in the Army before being discharged after a cancer diagnosis. He beat cancer and then entered law enforcement as a correctional officer. He was Charles Manson's prison guard, among others, at San Quentin. His own personal story includes heart issues and dealing with divorce and depression in his family. The bulk of Briggs career was with the California State Highway Patrol, including more than two decades with the Marin County office. There, he worked predominately on the Golden Gate Bridge, which every month produces four to six suicidal subjects, multiple traffic collisions and dozens of other law enforcement calls. After 9-11, security was heightened even more. Briggs had no training with suicide prevention or mental illness before taking the job but has since become such a respected expert that he s helped train the FBI and several major corporations. He's been called a true American hero by Robert Gebbia, director of the American Foundation for Suicide Prevention, and is among the country's most active speakers in promoting crisis management, leadership skills, and suicide intervention and prevention worldwide. His TED Talk has been viewed well over a million times. More Americans die of suicide than homicide every year. Nine percent of Americans are dealing with depression at any particular time, many of them with major depression that can last a lifetime. Depression is the leading cause of disability for Americans age 15 to 44. These are under-appreciated problems in our country, at least in part, because they're usually hidden and often come with a stigma of shame. 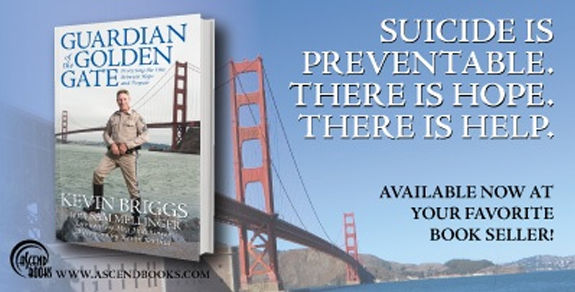 In Guardian of the Golden Gate, Briggs shares his experiences with the help of people who credit their lives to him. His inspiring story will help shine a light on a killer that lurks in the darkness and show people signs to look for and the value of hope. You will gain insight into this steadfast hero that will allow you to see why he's known as the Golden Gate's guardian. Kevin Briggs aims to promote mental illness awareness and ultimately break the stigmas associated with it. By reading this book, you join him in that pursuit. Suicide is preventable. There is hope. There is help. Kevin Briggs is one of the country's most active advocates for suicide awareness and prevention. Briggs has been featured in "The New Yorker", "Men's Health", and "People" magazines as well as several national radio and television shows. Briggs regularly travels the country helping businesses learn crisis management and people better learn the signs of suicidal risk as well as the best steps to help prevent a tragedy that still takes the life of an American every 13 minutes. He is the father of two boys and lives in the San Francisco Bay Area. Sam Mellinger has worked at "The Kansas City Star" since 2000, the last five years as a sports columnist. His work has been honored by the Associated Press Sports Editors, Kansas and Missouri Press Associations, and Best American Sports Writing. He lives in Kansas City with his wife Katie and son Samuel. This is his second book.